Have you ever wondered how much a Steinway piano costs? The cost of a new 5’1″ Steinway S piano is $69,700. 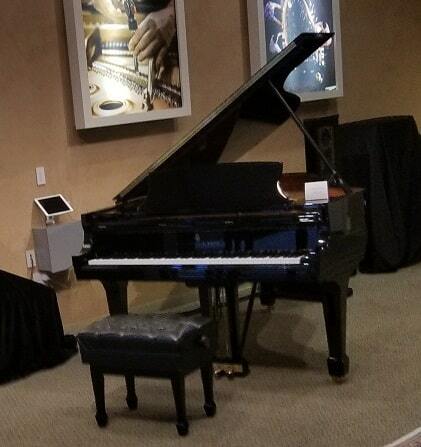 Larger Steinway pianos like the 9′ model D cost $171,000. Smaller Steinway pianos like model A, B, L, M and O cost between $74,300 – $129,000. Used Steinway pianos average 48% of the current MSRP prices. Owning a Steinway is a common dream among most serious pianists. They are one of the most celebrated piano brands in the world. Whether it’s a new or used Steinway, it’s important to know what to look for when purchasing one of these instruments. Below I’ll share with you the latest pricing charts for these pianos, some helpful buying tips, and much more! Steinway pianos are very expensive pianos, although not nearly as expensive as some of the luxury pianos from Fazioli or Bosendorfer. In addition to being one of the most recognizable piano brands in the world, Steinway pianos are also built extremely well. 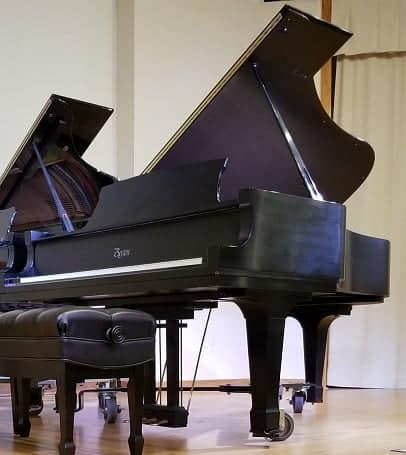 Model O $83,000 5' 10.5"
Model B $109,000 6' 10.5"
Model D $171,000 8' 11.75"
If you’ve ever been to a piano showroom or even shopped online for a Steinway piano, you might notice the prices vary greatly. This has a lot to do with the market. Even more so, the average price of a Steinway is greatly affected by the size of the piano and what materials are used in the finish. For example, a Steinway D in a basic Polished ebony or Satin finish costs around $171,100. Now, compare that price to a new Steinway D made with a Mahogany finish that runs at $200,000. There are even special models that come in unique finishes like polished white, finishes with unique engraving, encrusted precious stones, and much more. Some of the more unique and more expensive finishes include Indian Rosewood, Macassar Ebony, Dark Cherry, and Kewazinga Bubinga. Generally speaking, custom or limited edition Steinway pianos are going to cost significantly more than a standard satin or ebony finish. Size really does play a part in the final price of a Steinway piano. The bigger the instrument, the more wood materials, action parts and labor required to build that piano. Bigger pianos provide much more tone, and aesthetically they look better. Naturally, the price will be higher to accommodate for that. It already takes a long time to build a piano, so adding more size increases that time. This is not just the case for Steinway, but also for other piano dealers. Especially piano manufacturers like Bosendorfer and Stuart and Sons who make pianos as large as 10’3″ in length! 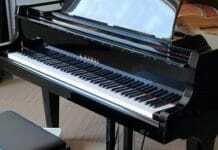 In some situations, smaller pianos may actually fetch a bigger price than the bigger ones. This has a lot to do with the condition of the piano, whether it’s a state of the art design, or even if it has Steinways Spirio technology built-in. The market has a great impact on new Steinways, but it’s actually more impactful on used Steinways. As the price of today’s Steinways increases, the price of a used Steinway will also increase. This helps the prices stay competitive, but also is not the best for consumers. Used Steinways typically sell for a certain percentage of their counterpart model. The older the piano is, the cheaper it will be, however, those rates still rise. For example, a simple Google search for a used Steinway will bring up a 2004 Steinway model B for $49,500. Compared to today’s price for a Steinway B, the piano would cost $108,000. Doing the math it’s easy to see that the seller is charging around 46% of the original price for a piano that is 15 years old. In some cases, the older more “antique” Steinway pianos cost more than those made in the last 20 years. For example, the same seller is selling a 1950 Steinway B for $59,000! While Steinway pianos are considered by many to be the best of the piano brands, any piano that’s been poorly maintained will always fetch a lower price. Right away a new Steinway piano is always going to win this challenge. The piano is fresh out of the factory with no previous owners. It’s been tuned, regulated, and thoroughly tested to meet every standard that pianists desire. Because of this, new Steinways will almost always fetch the best asking prices. With a used Steinway, things get much trickier. This is quite evident in situations where a very old piano like a 1920s Steinway was kept in great condition, but a more modern instrument like a 1998 Steinway wasn’t as well cared for. Many old pianos undergo full rebuilds. This means the instrument is broken down by removing all of the old parts. From here the parts are sanded down, and in many cases, the piano is refinished on the outside as well. To replace all of those old parts with genuine parts means sending it to a reputable Steinway rebuilder or to the factory itself. The piano is essentially built from scratch again with precision (with the exception of making a new piano case). 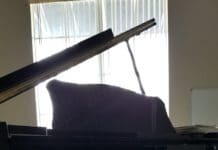 Because of this, it’s really easy for piano dealers to sell old Steinways that have been refurbished or completely rebuilt for much more than one that has all of its original parts, scratch marks, and worn mechanisms. The action of a piano is one of the most complex parts of the instrument. It is also the most expensive area of the piano. A Steinway piano contains 12,116 separate parts. Most of these are made from either wood, metal, or felt material. Some of the most expensive parts include the piano casing, the hammers, keys, bridges, and of course the soundboard. The soundboard is made from several layers of aged spruce. Sourcing that wood is not only time consuming, but it’s also an expensive process. Other parts made of metals like nickel and steel include the tuning pins, strings, action railing, front and rear duplex, and bell casting. Each of the parts of a piano has pretty big costs associated with them. If a piano was being repaired, you would most likely have to buy all of the parts you need in a set for the sake of uniformity. For example, a set of bass strings costs around $300. Sets of damper felts and hammer felts are also expensive. Hammers cost around $600, and the repetition costs around $1200, and the backchecks cost around $250. This is one reason genuine rebuilt pianos fetch such a steep price. It’s essentially a brand new piano again because it is filled with new and expensive parts. If you find a rebuilt Steinway that is cheap, chances are it was rebuilt with cheap parts. Purchasing a new piano is a fairly straightforward process. While many piano dealers sell all types of pianos, it’s always in your best interest to go straight to an authorized Steinway seller. Steinway piano galleries are where you’ll find the best quality pianos in your area. You can shop in the gallery with confidence, knowing that the instrument is genuine, was shipped properly, and has been properly prepped for display. When making an offer for the piano, it’s a wise idea to ask what kind of discounts you the seller can apply. Although Steinway piano galleries don’t compete with one another, it’s not out of the ordinary to talk the asking price down by at least 10%. Bigger down payments also lead to smaller monthly payments. Don’t be afraid to negotiate with the seller! Many times they can offer you unique warranties, free instrument maintenance, and special financing that is not advertised to the public. Keep in mind that the piano will depreciate in value the moment it has left the showroom floor. To make sure you don’t have buyers remorse, be sure to playtest several Steinway pianos. Try out several models, and never rush to a buying decision. The showrooms are always cycling new pianos in and out on a regular basis, and chances are one you really like make come into the store at a later date. Purchasing a used piano can be a tricky task. Over the years prices for Steinway instruments has risen. While a used Steinway will always cost less than a new Steinway piano, the used price is entirely dependent on the latest price. A typical used Steinway sells for 47% – 50% of today’s prices. For example, if a new Steinway S costs $72,000, then one can expect to pay between $34,000 – $36,000 for the instrument. 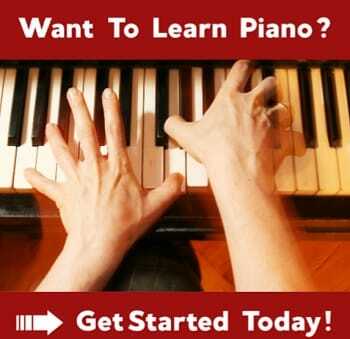 This of course only applies if you are purchasing the piano through a licensed dealer. A Steinway that has been rebuilt with genuine parts holds significant value. This is basically a brand new piano. Steinway has been innovative over the years, perfecting their technique. The materials they use in their pianos, as well as their methods for building pianos, has been fairly consistent for many years. A safe way to know you’ve got a genuine Steinway is to purchase it from a Steinway piano gallery. These shops specialize in nothing but the Steinway brand and do a lot of the research on your behalf to make sure the instruments are genuine and in working order. It’s always a safe bet to make sure that the Steinway piano you have your eye on was rebuilt at the restoration center. The restoration center does more than just repair old Steinways. They carefully comb the instrument and replace all 12,000 parts with genuine ones. This is also the only place a Steinway can have its soundboard replaced considering they do not sell that crucial part to anyone. If anyone claims that they had the soundboard replaced anywhere else, it’s most likely not real. The restoration center also provides a 5-year warranty and a certificate of restoration. When purchasing a Steinway on the secondary market, it’s important that those documents be made available if the piano has had significant work done to it. If a Steinway has not been rebuilt with genuine parts, then, by all means, it’s no longer considered to be a Steinway piano. While it’s not entirely a genuine Steinway, it still is a functioning piano. Because of that, it will always fetch some significant value. Many times sellers will try to pass off rebuilt Steinways that have used action parts that do not quite work for the instrument. Using those parts can not only change how well the piano plays but also the kind of sound that it produces. When comparing it to another rebuilt Steinway with genuine parts, you can almost tell right away that you’re dealing with a fake piano. If the soundboard, hammers, or even the strings are different, it will simply produce a much different sound than a normal Steinway. For the average customer who does not do their research, they might end up overpaying for the piano simply because of the Steinway logo. When attempting to purchase a piano of this magnitude, it’s important to be careful during the inspection process. Anyone selling their used Steinway should have an extensive background on its repair history, certificate of authenticity, and much more. I highly recommend hiring a piano technician with extensive knowledge of Steinway pianos to look at the instrument thoroughly. They’ll be able to help with confirming the serial numbers on the instrument, looking for damage and poor repair work. Most importantly, they’ll be able to help determine if the seller is trying to pass off any part of the instrument as real when it is not. In some instances, you may encounter an old used Steinway that has not had significant work done to it. This will likely be a piano post-1980s. In my experience, this is the more preferred option for two reasons. This is what I would consider being a basic used instrument. It’s sold as is, and the hope is that the original owner took good care of it. There are some situations where these pianos have come into the possession of the owner by a previous owner. In that case, you’ll want to get as much history on the piano as you can. There’s a chance the piano was repaired with parts and the owner of the instrument is simply unaware. To truly save on the cost of a Steinway, pianists should be seeking out sales on the secondary market. This includes resources like Craigslist, Facebook Market Place, local churches, and newspaper classifieds. While this is a great way to save several thousands of dollars, chances are you will have to really shop around. 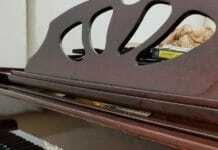 Most pianos sold on secondary marketplaces come with significant flaws. However, there are certainly gems out there where people have well maintained their instruments. When attempting to purchase a piano of this magnitude, it’s important to be careful during the inspection process. Anyone selling their used Steinway should have an extensive background on its repair history, certificate of authenticity, and much more. It is well worth investing in a piano technician to give the instrument a full survey before committing to purchasing it. One downside of the secondary market is payment plans. Most times, individual sellers want all of the money up front for the instrument. In this case, you may need to take out a loan as you would with a piano dealer and commit to paying that back. If you plan to purchase a piano from an individual, also consider drawing up a contract. This way both parties can agree to an official sale. This helps when filing taxes, and it also offers a layer of protection if someone wants to renege on the sale. While Steinway & Sons are the main brands, there are some entry and mid-level pianos that they also produce. This includes their Boston and Esx series. What makes these pianos unique is that they are designed with a lot of the same parts and specifications that regular Steinway & Sons pianos are made with. There are also many unique innovative additions to the Boston piano. This includes the quad shaped pin block which allows for better tuning and string tension, and the same hammer design used in regular Steinway pianos. Boston pianos also feature a unique wide tail design which helps with sound projection in a more compact instrument. Although the Boston pianos are 5’4″, they sound much larger than that. For example, the rim of a Boston piano is made with several layers of hard rock maple. It also features a solid soundboard instead of a laminated one. It’s also a tapered soundboard so that the tones in the bass are well balanced with the treble. Steinway produces their pianos in two different locations. The most recognizable in the United States is in Astoria, New York. These Steinways are recognizable from their label located on the inside plate. The other location is in Hamburg. Hamburg Steinways are much different than the New York version. Most notably is the overall pricing. A Hamburg Steinway costs around $86,500 for the 5’1″ model. That nearly $20,000 more than the New York version. Models, A, B, C, and D are all north of $103,000, with the D priced near $180,000. As far as how the pianos are built there are several big differences. Firstly, the Hamburg Steinways use beech wood for the rim compared to the hard rock maple found in New York Steinways. The Hamburg pianos are also routinely finished in polished ebony. The Renner action, compressed hammers, strings, and even design of the piano arm are all much different. Next articleOrgan Vs Piano – Everything You Need To Know!